Adaptive skiing provides people with disabilities the opportunity to enjoy the thrill of snow sports at resorts and facilities throughout North America. This resource informs adaptive skiers of all levels how they can access and enjoy programs at many of the major resorts in the US and Canada. The roots of adaptive skiing stemmed in Europe around the time of the Second World War but in 1967 Disabled Sports USA was set up by a group of Vietnam veterans. The organisation was initially known as the National Amputee Skiers Association. It was started to help returning injured servicemen fighting in the Vietnam War. There have been many ground-breaking introductions of adaptive ski equipment over the years. The first ski outriggers were created around 1970. These were followed by a list of other game-changing devices in the sport including the ski bra in 1974, which prevents ski tips from crossing, the first sit ski in 1978 and the mono ski in 1984. In the early 1990s adaptive skiing moved on from a recreational and rehabilitating sport to a more advanced network of community programs and competitions. In 1992 adaptive skiing was first accepted into the Paralympics. There are three points of contact with this type of skiing, the third being a handheld outrigger. It requires a lot of strength in both arms and legs and it is a common method of skiing for above-knee amputees and people with single limb weaknesses. This method of skiing involves four points of contact with the snow and two outriggers are required. There are a few different types of four-track skiing. Skiers who can stand independently can use this method with the two outriggers providing support and balance. Other adaptive equipment can be used as well as outriggers. Ski clamps can be used if a skier requires lateral stability to enable their stronger side to aid control over their weaker side. A further method of four-track skiing is snow sliding. This is suitable for people with more severe balance issues and involves a metal frame with skis which the skier is mounted to in a stand-up position. They ski in their own boots and skis and are then guided by instructors. Often referred to as sit-skiing, these types of skiing involve sitting in a seat which has a ski (mono) or skis (bi) underneath it. Skiers will also use outriggers to assist with balance and turning. Both mono and bi-skiing require lots of upper body and core strength. Many adaptive skiers who cannot ski independently will use bi-skis with a piloted bar behind at the rear for a guide or instructor with their own skis to drive the sit-ski. The methods of skiing are often undertaken by people with spinal cord injuries, multiple sclerosis, muscular dystrophy and amputees. This type of adaptive skiing is undertaken with a guide. Depending on the level of visual impairment the guide will either ski in front of the individual, to the side or alternatively give instructions while skiing behind. There are a number of fantastic ski resorts based in the USA, many of which offer fantastic facilities for disabled people. Check out Crystal Ski Holidays to grab a saving before you book your next ski trip, and read on for specific information on some of the best resorts. The resort has a sensational backdrop of the epic Teton Mountain range and the village at the bottom of the resort is actually called Teton Village. It's an intimate village that is becoming increasingly popular due to excellent snowfall in recent seasons. In 2013/14 Jackson had 500 inches of snowfall, which was the most of any North American vacation resort. 2015 will be Jackson Hole's 50th season of operation. Jackson Hole does have a bit of everything but it is a resort regarded for its challenging terrain. For the more experienced adaptive skiers and for those who enjoy the back country, Jackson is the perfect playground. The Four Seasons is the best suited hotel in terms of accessibility. Located in the heart of Teton Village, they have accessible guest room features including flashing light alarms, hearing impaired phones, grab bars and a wedge ledge on both sides of the bath. The rooms also have roll-in shower access and a lowered peephole and room safe. In terms of getting around the hotel itself the accessible rooms can be easily reached from the hotel entrance and there is good access to the meeting rooms, ballroom, restaurant and exercise facilities. Service animals are permitted in the hotel. Jackson Hole Airport is located on the edge of the Teton Mountain range, meaning it's just a short 30 minute drive to get to resort. This season will see an 8% increase on air capacity heading to Jackson Hole Airport. There will be 13 non-stop flight options from 13 major US cities to the nearby airport. You can fly to Jackson Hole from London with British Airways. The adaptive access in the village is not great for the whole village, which is mostly due to a lot of the ground being covered by snow. However there are some heated sidewalks but it is hard to get everywhere without crossing snow. There is a daily public bus service called START Bus, which offers mobility to people with disabilities. The service runs throughout the winter season and transports people in and around Teton Village. It isn't free so see their website for fares dependent on your destination. If you or a member of your party has a disability and wants to try an alternative to skiing, then check out The Jackson Hole Therapeutic Riding Association. They offer adaptive horse riding for all ages. There is a cracking deal to take advantage of this season. The resort is offering a free night of lodging and a free lift ticket if you buy four or more nights for qualified dates throughout the season. The package is called ‘Ski Free Stay Free’ so check out the Jackson Hole website for full details. Whistler Blackcomb is one of the more picturesque and idyllic resorts in North America. You have Whistler Mountain and Blackcomb Mountain, which are both connected by a large bustling town at the bottom of the two mountains. Due to its picturesque location, which is packed with tree skiing and wide open plan slopes, Whistler Blackcomb is an extremely popular winter destination. The slopes are most suited to intermediate and advanced skiers but there are some wide easy interlinking runs back to the village, although these can get congested at the end of the day. For more confident skiers, Whistler has a big selection of terrain to take advantage of, including lots of tree skiing. For those who want to venture into the backcountry, cat skiing and guiding is available. The Westin Resort and Spa is close to the main lift stations and has two rooms that have been modified for wheelchair users. These come fitted with shower and toilet railings and shower chairs are also provided. There is good access to the hotel pool via the elevators. Just down the road is the Hilton Whistler Resort & Spa, and it has very good accessibility options. They have accessible parking, elevators, rooms and meeting rooms. Other accessible features at the hotel include audible alarms, roll-in showers, braille elevators, visual alarms for hearing-impaired in rooms, hallways and public areas. The hotel has ramp access for the lobby and reception areas, as well as the entrance to the building. Vancouver International Airport is a 2.5 hour drive away from the resort but there is an excellent organization called Whistler for the Disabled, who provide a host of transport options for people with disabilities. One of these is a wheelchair accessible coach that runs between downtown Vancouver and Whistler. If you need a bus from the airport it is advised to book through Pacific Coach Lines who provide a similar service from the airport. Most who have travelled from the airport to Whistler before with a disabled person in their party recommend going through Enterpise for car rental. They don't do vans but they do provide a good range of mobility devices for people with disabilities. If you require van rental, the only company who provide them are Freedom Van Rentals. Alternatively, if you want to book a taxi up to the resort then Yellow Cabs Vancouver offer wheelchair accessible vans. Access is very good around the village. 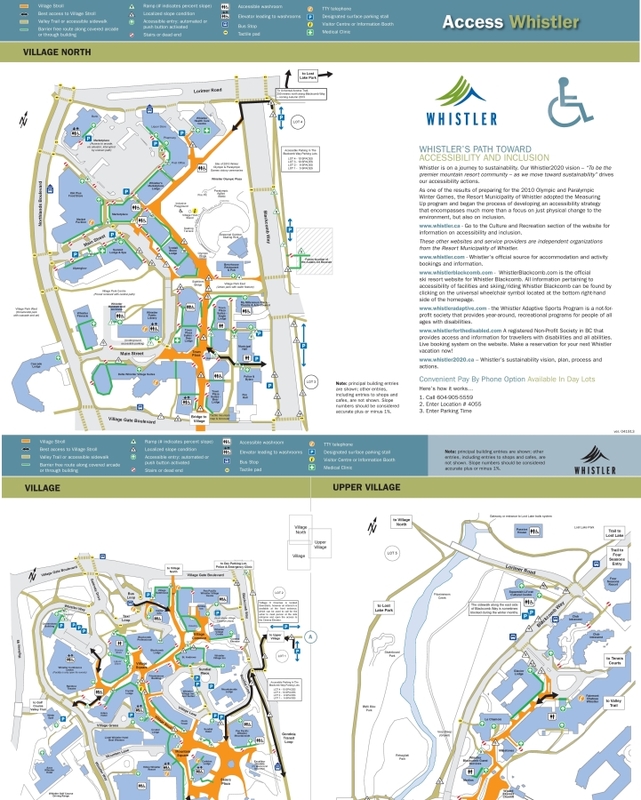 Since Vancouver hosted the Winter Olympic and Paralympic Games in 2010 Whistler Blackcomb began a program to improve the accessibility around the village and mountain. It focused on the inclusion of every visitor and by 2020 they plan to be ‘The premier mountain resort community’ as they move toward sustainability. Here is a detailed map of the village layout and the accessibility routes throughout it. The village is well pedestrianized, which allows simple access between the hotels, apartments, shops and the slopes. There are many wide paved paths designed for hiking and cycling access, which makes it easy for people with disabilities to get around the resort. Taxis run on a 24 hour basis and some of these if requested provide wheelchair access. During the ski season the resort provides free shuttle buses to the most popular ski lifts. Many of these are also low-floor buses, which can decline to allow wheelchair access and mobility ramps are also provided on these services. These buses can be boarded at accessible stops around the resort, which are identified by a sign featuring the international symbol of access. (Show image here). Assistance animals are allowed to travel on these buses and attendants will be permitted to travel for free. In terms of wheelchair access, Whistler is definitely more accessible than Blackcomb. The main village gondola from Whistler village accommodates for wheelchair access and once at the summit the skier can transfer to a sit-ski and have their wheelchair returned to the bottom of the mountain to be picked up at the end of the day. This is not the case in Blackcomb but pretty much every chairlift in both ski areas caters for sit-skiers as well as other types of adaptive skier. For the more extreme visitors with a disability who want to really experience Whistler, check out 9 Lives Adventures. They offer a range of extreme opportunities including bungee jumping, snow mobile riding and skydiving. If you decide to fly with Air Canada Airlines they have developed an award winning system of lifting wheelchair users in and out of their plane seats. Jane Sowerby is an adaptive ski instructor and former Paralympic skier. She kindly agreed to share her thoughts on adaptive skiing in Whistler: ‘There is a huge range of slopes to suit all levels of ability. There are a lot of chair lifts, but to access the main slopes it's easier to use the cable car. As the staff were very helpful, I was able to stay in my wheelchair until the top while they sent my sit-ski up. Located up in the mountains of Grand County, Colorado, Winter Park is a stunning family-friendly resort with varying terrains for all levels of skiing ability. The village is very accessible and it's relatively simple to get to the slopes. It's a great place to ski for beginner and intermediate terrain and the village has good wheelchair access. The resort is also home to The National Sports Center for the Disabled (NSCD). Fraser Crossing, which is a modern Crystal Ski hotel/apartment building provides excellent accessibility throughout their accommodation and it's only a minute from the slopes and the popular Zephyr chairlift. They have adaptive rooms, which feature wheelchair accessible light switches and kitchens, extra floor space to aid wheelchair movement, wheel-in showers, toilet, bath and shower rails, and a lowered sink and mirror. For the communal areas of Fraser Crossing there is a ramped entrance to the hotel, automatic entry doors, disabled toilet, lifts to all floors and storage available for sit skis. The hotel is also located on the free shuttle bus route. The Vintage Hotel in resort has ADA accessibility and the Zephyr Mountain Lodge has accessible facilities. The Best Western Alpenglo Lodge is not in Winter Park but it's just two miles down the road and the areas regular free shuttle bus service makes it very easy to get up the hill. The lodge has 58 rooms, of which many are ADA Accessible. In-room features include accessible doorways and bathrooms as well as lowered room controls, such as lighting and air conditioning. Public space features include accessible parking spaces, ramped access to the lodge entrance and lobby, accessible tables in the eating area and disabled toilets. It's worth having a look at Apple Vacations too, who provide good rates on lodging in Winter Park. Denver International Airport is the nearest airport to Winter Park. It's a 67-mile journey North West to the resort. Follow the I-70 west from the airport until exit 232. Then follow the US 40 all the way up to the mountain. There is a transport company from the airport called Home James. They offer a large minibus and smaller private vehicles to get to the mountain. There are numerous car rental companies available from the airport too as well as taxi services. Winter Park has a big selection of terrains suitable for beginner and intermediate skiers. There are plenty of connecting areas and meeting points on the mountain and there are some nice runs down to the village. For the more advanced adaptive skiers there are still lots of steeper slopes to challenge yourselves on and towards the Mary Jane section of the mountain there are mogul hills and tree skiing opportunities. There is an excellent free bus service that runs around the resort and between the nearby area of Fraser called ‘The Lift’. There are 8 different lines/services with lots of pick-ups and drop-off points between the two locations. All these buses are wheelchair accessible. The resort has a variety of four and three man chairlifts, may of which are high speed, meaning they slow down at the boarding point. This makes it easier for sit-skiers and other adaptive skiers to access the lifts. There is also an eight-man gondola which is accessible for adaptive skiers. Jane Sowerby has led many adaptive ski groups at Winter Park and has a vast experience of the resort. She says: ‘This has, in my opinion, one of the best adaptive programmes in North America. NSCD has the equipment, skills and experience to cater for a wide range of disabilities. There are loads of beginner slopes, all easily accessible by chair lifts. There are also plenty of advanced runs for those who want it. Their lessons cover a huge range - from complete beginners to more advanced skiers through the “All Mountain Programme”. ‘Transport is excellent in the resort. There is a free door-to-door accessible bus with a platform lift. This runs until about 11pm and they will take you anywhere between Winter Park and Fraser Mountain. Unfortunately, they're not allowed to drop you right next to the NSCD, so it can be tricky getting around if it's snowed, until you get to the lovely heated clear pathways around the main building. ‘There are some great hotels in downtown Winter Park - the Best Western has an adapted room with a wheel-in shower. A lot of the newer hotels up by the lifts are more accessible, but tend to be more expensive. There are plenty of disabled toilets around the resort and there are wheelchairs available in the cafes at the top of the mountain if you want to stop there for a break/ toilet. ‘The lifties are fantastic at offering help for sit-skis as they're so used to seeing us around. Some resorts will provide in-house programs with qualified instructors and guides. Here's a selection of the leading organizations. The resort has its own program for adaptive skiers of all ages and abilities called the Jackson Hole Mountain Sports School. The school's qualified adaptive instructors run full or half day lessons as well as adaptive camps. All equipment is provided and they meet at the Bridger Center and the Kids Ranch in resort. The Jackson Hole website provides directions to these two spots and there is accessible parking at both. They also run the Adaptive Skiing Awareness Day, where you can learn more about skiing with a disability. The annual event is now in its fourth year. Get in touch with Jason Malczyk for more information about the Mountain Sports School. He can be reached on 307-690-4774 or via email at Jason.malczyk@jacksonhole.com. The Whistler Adaptive Sports Program (WASP) works in partnership with the Whistler Adaptive Ski and Snowboard Program to offer a range of individual ski and snowboard lessons for people with cognitive and physical disabilities. All lessons are taken by trained instructors with specialized equipment and techniques to suit all levels of disabled skier. Although the instructors are highly trained in coaching various fields of adaptive skiing they are not able to support specific toileting needs or administer medication so they advise that a family member of carer meet them throughout the day if this is required. There is the possibility of a free lift ticket in this case. You'll find the program headquarters inside the Carleton Lodge, which is opposite the Blackcomb Excalibur Gondola. The check-in point is at the back of the store and there is wheelchair access and ramps on the left side of the building. For any queries give them a call on 1 (604) 905-4493 or drop an email to info@whistleradaptive.com. These specific providers of adaptive snowsports lessons and camps offer a large range of opportunities for skiers with disabilities visiting North American resorts. Below is a selection of some of these organizations. BC Adaptive Snowsports runs skiing and snowboarding programs for people with physical and cognitive disabilities. These programs are overseen by a number of volunteer highly qualified instructors, coaches and administrators. They oversee the delivery of programs from grass roots to high performance in partnership with 13 adaptive snowsports clubs in the region to give more adaptive skiers and snowboarders the opportunity to enjoy the sport and to meet new people. Their headquarters are at SW Marine Drive, Vancouver so give them a call or send them an email to find out more about their adaptive snowsports programs. They offer a huge selection of adaptive sports options for people with physical, cognitive, developmental and emotional disabilities.When it comes to skiing they provide lessons and camps at Killington, Sugarbush and Pico Mountain. Individual lessons are available seven days a week during the season and this applies to skiers of all ages and ability. They also have a large wounded veterans program and they host the United States Association of Blind Athletes Winter Festival every year. Located opposite the Blackcomb Excalibur Gondala, the WASP headquarters can be found at the Carleton Lodge, which has good wheelchair access. They offer lessons and programs in adaptive skiing for children and adults taken by trained instructors. All levels of adaptive skiing are catered for and the instructors are trained to use all forms of adaptive equipment. Adaptive Skiing is just one of many sports and activities provided by Challenge Aspen. The organization offers adaptive skiing opportunities and lessons in Aspen throughout the winter. Mono and bi-ski, two, three and four track equipment is all provided and visually impaired skiing instruction for both alpine and Nordic disciplines is also available. This organization improves the lives of people with disabilities through a range of sporting activities, education and recreation. They have their own ski and snowboard school located at Girdwood by the slopes of Alyeska Resort. Their team of experienced instructors look after more than 1,000 people every year teaching beginner, intermediate and advanced adaptive skiers. For the more experienced skiers there are opportunities to enjoy cat and heli skiing with Challenge Alaska. Since 1974 VASS has been offering skiing programs from Grouse Mountain. They now run skiing and snowboarding for the disabled programs at Seymour and Cypress Mountains as well as Grouse. Their experienced instructors and volunteers provide lessons for people of all ages and abilities from first timers right up to advanced ski racing. The organization is affiliated with The Canadian Association for Disabled Skiing and with BC Adaptive Snowsports. For more experienced adaptive skiers there are many programs to enjoy, including the Grouse Sit-ski program, which involves evening skiing on Grouse Mountain and is aimed at those who have had an introduction to sit-skiing. 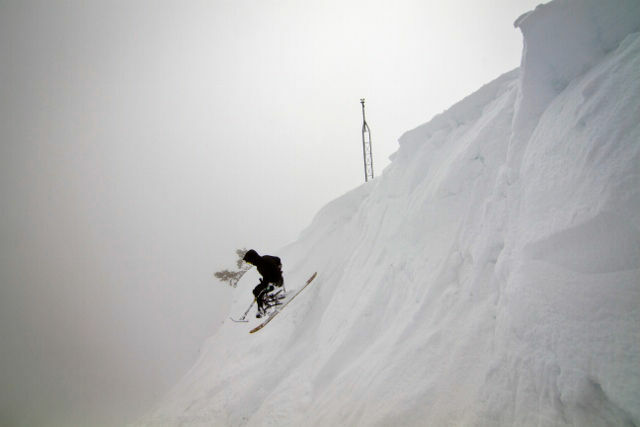 intermediate and advanced skiing programs are also held throughout the winter season on Cypress Mountain. I would like to personally thank Jason Malczyk from the Jackson Hole Mountain Sports School and the team from backuptrust.org.uk, especially Jane Sowerby and Ally Ward. Without your help this resource would not be possible. There were countless organisations, news items and resources that helped us put our Adaptive Skiing Resort Guide together - so find below the full collection. National organization that runs a range of sports programs for people with disabilities. They have a number of chapters across the US offering programs including adaptive skiing, swimming, golf and cycling. They provide people of all ages the opportunity to take part in differing forms of adaptive skiing, such as alpine/downhill, nordic/cross country and snowboarding. One of the most sought after resorts in North America for ski vacations. Also one of the best for disabled access. They run their own in-house adaptive ski program and the village has a selection of easy access trails and routes for wheelchair users. The resort has excellent transportation options and a good selection of accommodation and facilities for disabled visitors. As well as providing adaptive skiing lessons, Challenge Alaska operates a service and rental shop with state of the art adaptive equipment, including sit-skis, snowsliders and snowboards. The shop and lesson meeting point is based on the slope side of the beginner hill in Alyeska Resort, Girdwood, which provides excellent accessibility. One of the most informative resources for disabled access in and around Whistler Blackcomb resort. Their website provides a great insight into the best accessible accommodation, how to make the most out of tour bookings and transportation options around the village. If you are a first time visitor or you travel regularly to Whistler Blackcomb, Accessible Whistler is packed full of information that will benefit your stay. The organization has been running for over 40 years providing sporting opportunities for people with disabilities. 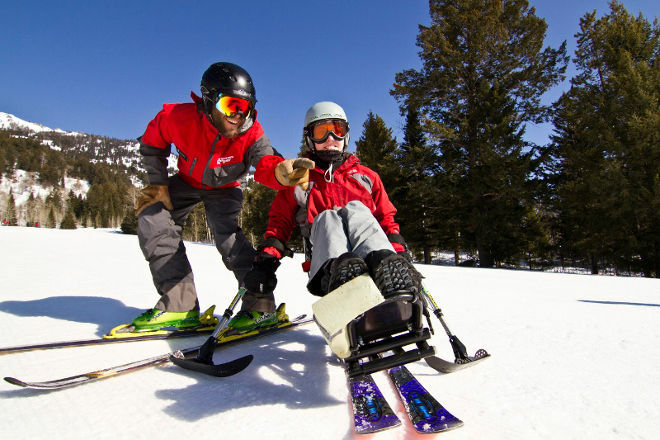 They offer adaptive ski programs in Alpine Meadows resort, Squaw Valley resort and Northstar resort. All lessons are carried out by PSIA (Professional Ski Instructors of America) and they coach varying disciplines of adaptive skiing. A highly detailed and resourceful organization providing information on global travel for wheelchair users. They are the largest database and online community for accessible travel. You can pick up useful knowledge of accessible group tours as well as details of which airlines provide the best wheelchair access. You can also read journals of people who have traveled with a disability. Breckenridge or 'Breck', as it is affectionately know as by the locals is a beautiful resort in Colorado. Due to it's location among the famous 14er mountain range, Breckenridge is usually guaranteed excellent snowfall throughout the season. There is adaptive skiing availability in Breckenridge and it is a popular resort for skiers of all abilities due to it's varying terrains. There is good disabled access around the village. 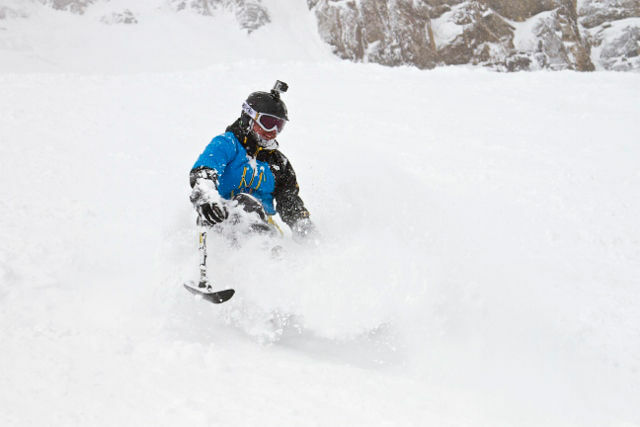 Jackson Hole is becoming an increasingly popular resort for intermediate and advanced skiers because of it's challenging terrains and backcountry accessibility. There are also good options for beginner skiers lower down the mountain. Teton Village, at the bottom of the mountain, has good disabled access with heated sidewalks and trails and there is good transport amenities for wheelchair users too. Vail remains one of the most idyllic and iconic resorts due to its sheer size. There is a vast amount of skiing terrains and the town has three vibrant areas with a range of shops, bars and restaurants. Vail is a popular resort for all levels of skier as there are many challenging slopes as well as easier terrains. In terms of adaptive skiing there are many opportunities to do this, including in-house programs. This organization was set up in 1999, and has been providing people with disabilities sporting opportunities including adaptive skiing, canoeing and climbing. They run adaptive skiing operations across the country with qualified instructors. They provide a good selection of equipment for all levels adaptive skier. One of the UK's major organizations for adaptive skiing. They offer trips, camps and lessons for all levels of skier. There is also the opportunity to take part in race leagues or to represent the British Disability Ski Team. Discover all the latest news from the world of skiing through the UK's biggest ski club. They provide regular up to date information on new equipment, snow reports and vacation discounts. Check out their online resort guides to discover which is the most suitable for disabled access. Innovative producers of sit-skiing technology. This company has been continually striving to increase the comfort and performance of adaptive skiing. Their groundbreaking dualski sit-ski was launched in 1996 and ever since they have been pushing the boundaries of what's possible for disabled skiers. Back Up Trust are a UK based charity that provide support and life changing experiences for anyone who has suffered a spinal cord injury. One of the opportunities they offer is an adaptive ski trip to Winter Park resort, where participants can enjoy coaching from qualified volunteer instructors. This association offers potential British ski instructors the training and coaching they require to become fully qualified. There is the opportunity to become an instructor for a range of ski disciplines, including adaptive skiing. This charity was set up by Mike Browne and Bob Grieg, both T12 paraplegics in the early 90s, It undertakes projects to improve specialized equipment for disabled skiers and sailers. This website provides exceptional detail on accessibility throughout the resort of Whistler Blackcomb. It contains disabled access maps throughout the village as well as testimonials from people with disabilities who live in the resort. Throughout the winter Ability Plus provide a large range of adaptive skiing programs at Mount Snow, Vermont. There are lessons for all levels of adaptive skier and there are also options to take part in the alpine race team and local area school programs. The team of staff and volunteers at Splore provide trips into Utah’s stunning mountain ranges for cross-country skiing day trips and excursions. They also offer snowshoeing trips through some of Utah’s most stunning and remote mountain paths. 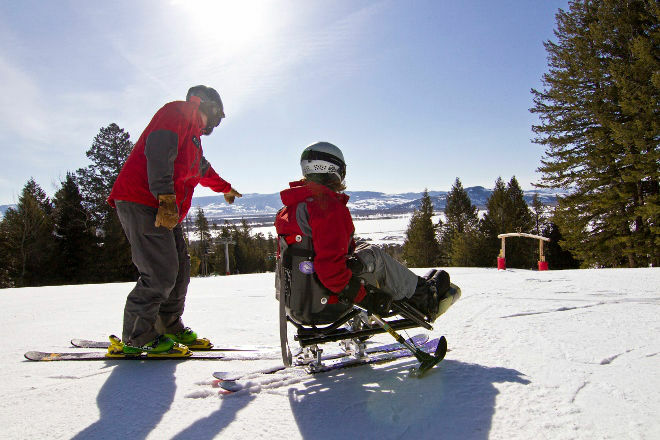 Partnering with both Grand Targhee Resort and Jackson Hole, the Teton Adaptive Sports group offer a number of adaptive skiing opportunities in both areas. They provide lessons for all ages and abilities of adaptive skier. 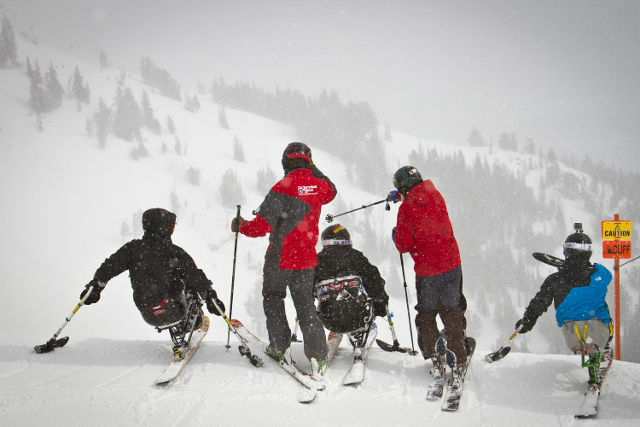 Camps and trips, such as the nine day Wyoming Adaptive Ski Experience are also available. Located at Winter Park resort in Colorado, this organization runs adaptive ski programs throughout the winter season for people with physical and cognitive disabilities. They have an excellent group of volunteer instructors and group leaders who make this happen year upon year. This program runs alongside Park City Mountain Resort, Canyons Resort, Deer Valley Resort and Brighton to offer all levels of adaptive ski lessons. The programs’ experienced instructors coach adaptive techniques to disabled skiers and their friends and families. Adaptive skiing opportunities are available at both Breckenridge and Keystone resorts through BOEC, which has been providing outdoor activities for people with special needs for over 35 years. Enjoy the stunning mountain range of Crested Butte in Colorado with adaptive ski lessons provided by fully qualified instructors. Group and private lessons are available for all abilities.